Although DisplayPort-equipped 4K monitors are still relatively new, the DisplayPort 1.2 standard underlying those devices is anything but. The long lead time between standards and products means that just as 4K monitors turn a year old, the DisplayPort 1.2 standard driving them will turn 5 years old later this year. This gap means that the VESA working group responsible for DisplayPort needs to aim well ahead of the curve, and all the while DisplayPort 1.2 adoption was ramping up, the VESA was already working on the next iteration of DisplayPort. Now after about 2 years of development the VESA has finalized their next standard, and this week they are releasing the DisplayPort 1.3 standard to their members for inclusion in their next-generation products. Like DisplayPort 1.2 before it, DisplayPort 1.3 is a combination signaling and feature update intended to support new products and ultimately enable DisplayPort to push more pixels. 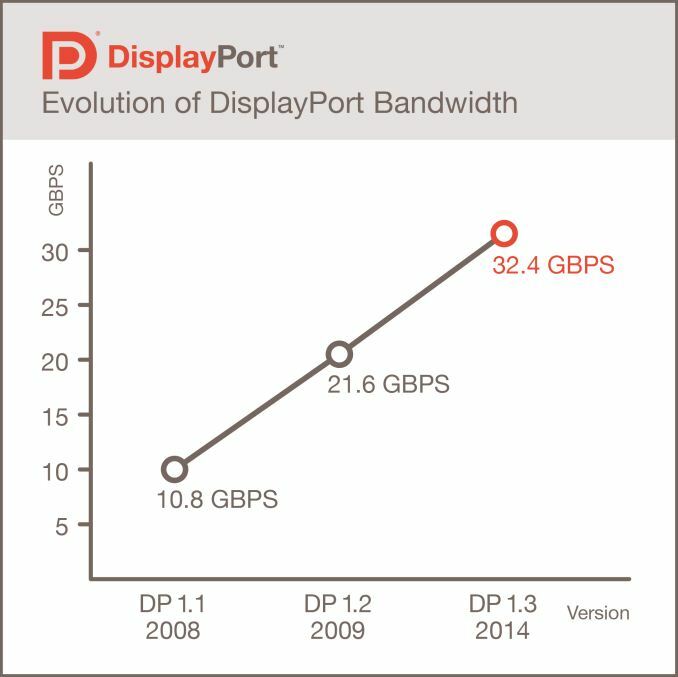 The single biggest aspect of this is the introduction of High Bit Rate 3 (HBR3) mode, which increases the per-lane bandwidth rate from 5.4Gbps to 8.1Gbps, allowing for a 50% increase in bandwidth over DisplayPort 1.2’s HBR2. For a full 4 lane DP connection, this means the total connection bandwidth has been increased from 21.4Gbps to 32.4 Gbps, for a final data rate of 25.9Gbps after taking encoding overhead into account. At a hardware level the introduction of HBR3 is being made entirely at the controller level, with new controllers utilizing HBR3 signaling over existing hardware. The DisplayPort/mDP connector itself and the physical cabling remains unchanged, meaning HBR3 is fully backwards compatible with existing cabling and should work on any DP 1.1a/1.2 cable that’s built to spec. Built to spec being a key phrase in this case, as in practice HBR3’s higher clock rate will likely expose inferior cables, similar to what happened with the HBR2 earlier this decade. 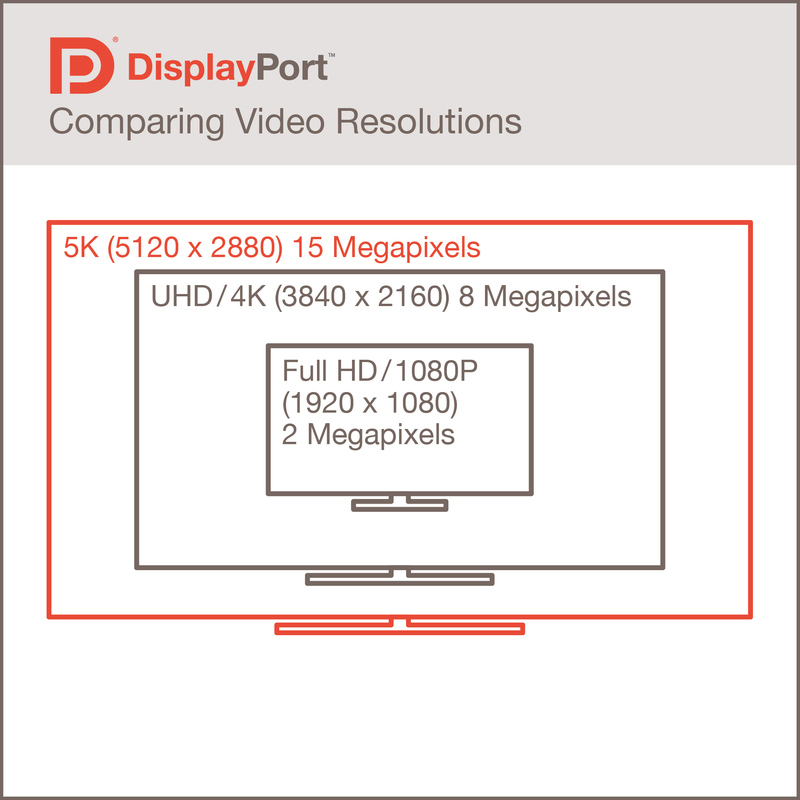 By incrementally improving DisplayPort’s available bandwidth in this manner the VESA is looking to bring about support for the generation of monitors beyond today’s 4K monitors that DP 1.2 was designed for. 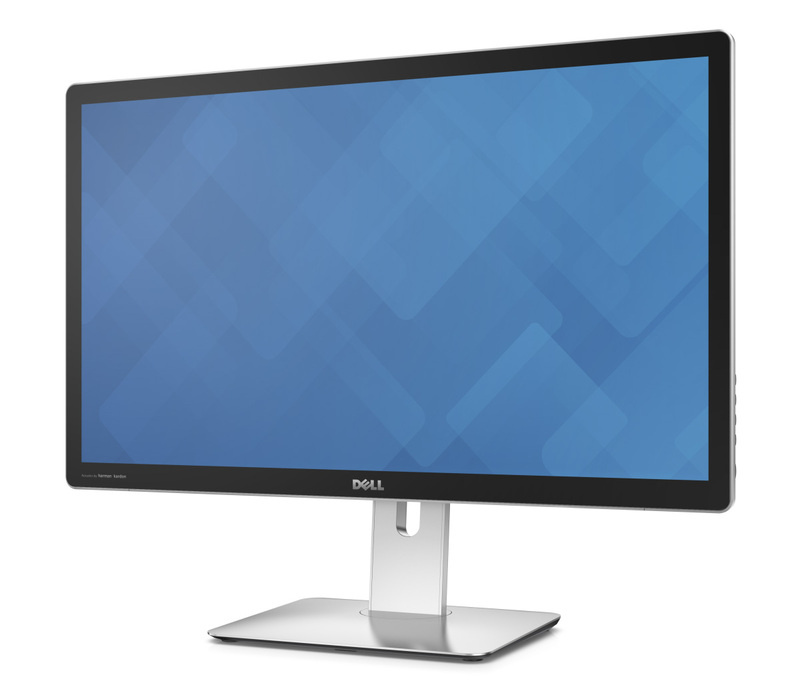 This includes both 5K displays – such as the recently announced Dell 5K UltraSharp – and even farther in the future 8K displays. 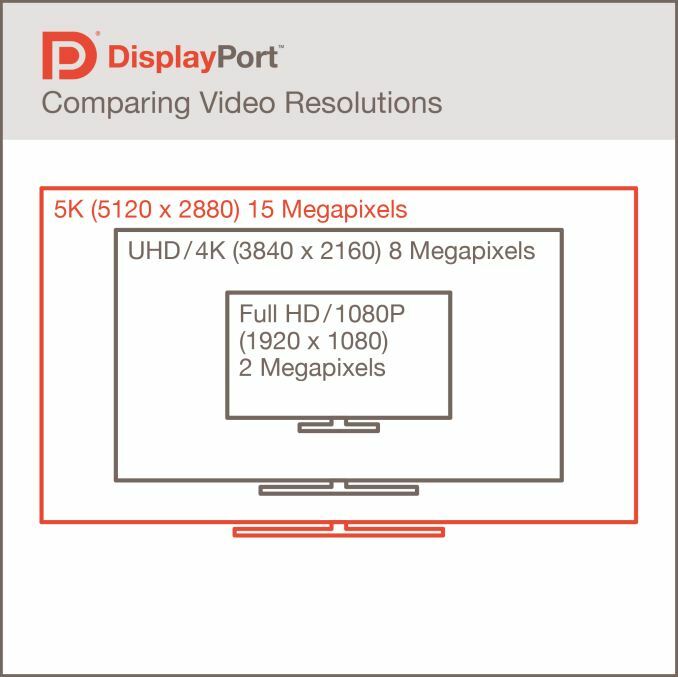 For 5K displays DisplayPort’s 32.4Gbps provides enough bandwidth to cover a single 5K@60Hz monitor with traditional 24bit uncompressed color. In that case the physical interface can support either SST or MST operation – DisplayPort is merely a data transport layer – however we may still see MST operation used by 5K monitors due to the fact that 5K would require a pixel clock in excess of 1GHz, which will take time for GPUs and display controllers to catch up with. Meanwhile the 50% increase in bandwidth also offers just enough of an improvement that DisplayPort 1.3 can even drive a pair of uncompressed 4K@60Hz monitors over a single connection, so long as VESA reduced blanking timings are used to minimize the signaling overhead. In that case you can technically even get a 4K@60Hz monitor over a 2 lane connection if desired, which would be useful for any situations where DisplayPort lanes are being taken for other uses (e.g. DockPort). Alternatively the additional bandwidth can be used to drive a single 4K@60Hz monitor at higher bit depths, such as 30bit and 36bit color. However for 8K displays, while DisplayPort 1.3 is designed to support them the available bandwidth falls well short of the 45Gbps+ an 8K@60Hz 24bit uncompressed display would require. 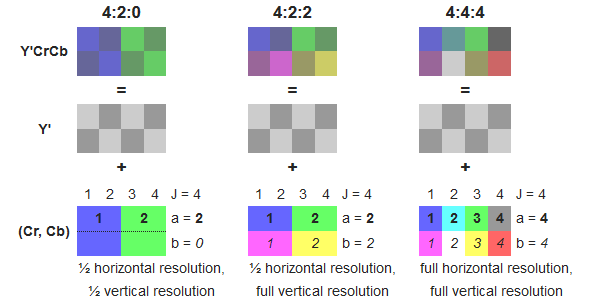 As such the VESA will be doing the next best thing and supporting Y'CbCr 4:2:0 subsampling, which reduces the bandwidth requirements by only transmitting ¼ of the color (chroma) data. We’ve already seen 4:2:0 put to use in HDMI, allowing first-generation 4K TVs to support 4K@60Hz over HDMI 1.4 data rates by reducing the color data rate to the same 4:2:0 rate that most media is distributed in, and the idea would be the same for DisplayPort 1.3 and 8K displays. 4:2:0 support in this case is a consumer electronics focused feature and is meant to drive high resolution displays handling video and other content mastered at 4:2:0, whereas lower resolution uncompressed modes would still be preferred for workstations and general computer displays. 4:2:0 support is also necessary for better HDMI interoperability, which is the other major aspect to DisplayPort 1.3. 1.3 will introduce the features necessary to allow DP-to-HDMI 2.0 conversion, and among HDMI-centric additions will be support for HDCP 2.2, which is the minimum version of HDCP required for DRM’d 4K media. Also being added for HDMI interoperability is Consumer Electronics Control (CEC) functionality, which allows HDMI devices to issue commands to other HDMI devices. This will allow DisplayPort to participate in that ecosystem, particularly having DisplayPort devices issue commands to other HDMI devices. Finally there are a couple of features in development at the VESA that are notably absent in some form or another. Support for Display Stream Compression (DSC) apparently did not make the cut, as it is not in the 1.3 specification. DSC is the VESA and MIPI’s visually lossless (i.e. limited lossy) compression format designed to reduce bandwidth requirements, and based on the VESA’s work we expect it’s still under development and would be surprised if we didn’t see it later on. Meanwhile to no surprise (but always good for clarification), DisplayPort Active-Sync remains an optional part of the specification, so Adaptive-Sync availability will continue to be on a monitor-by-monitor basis as a premium feature. Wrapping things up, like most VESA standards announcements today’s announcement is more of a beginning than an end for the process. Now that DisplayPort 1.3 is standardized manufacturers can begin developing controllers (and GPUs) around it, which traditionally takes several months. This would put the release of the first DP 1.3 devices in 2015, which we would expect to be further aligned to the product refresh cycles for the necessary GPUs and monitors. "Alternatively the additional bandwidth can be used to drive a single 4K@60Hz monitor at higher bit depths, such as 30bit and 36bit color." So DisplayPort 1.2 has a bandwidth of 21.6Gbit/s with overhead and 17.28 Gbit/s without. So i should be able to run the LG 31MU97 a 4096x2160x30@60 right? 4096 px, 2160 px, 60 Hz, 30 bit, aspect ratio 1.90, 15.93 Gbit/s. 17.02 Gbit/s, CVT-R, 21.27 Gbit/s TMDS, Pixelclock 709.042 MHz. 16.7 Gbit/s, CVT-R2, 20.87 Gbit/s TMDS, Pixelclock 695.714 MHz. It's odd because earlier reports from were that they were targeting so-called Super-HiVision 8K @ 120 Hz for DP1.3. I can see why DSC might be useful for compressing the output from a graphics card, but generally the cables between a computer and monitor are short and bandwidth is sufficient even without compression. The problem that really needs solving is how to transmit 4K at 60fps over long cables such as the ones that you might install between a receiver located in a rack in a closet somewhere and a projector or wall mounted tv. Cable tv, bluray, etc is already compressed so it seems stupid to uncompress, then recompress with DSC before sending down the display port cable to the tv.